The Grammar school’s Head, ‘Barrel’, looked as you’d expect a man with that nick-name to look: very round, with an unruly shock of white hair and a ruddy, square-jowled face. Back in the Lower Sixth Form, Year 12 as it is known these days, he ‘invited’ me to enter his lair and bade me sit in the ‘hot seat’ in front of his desk. Unsure of my transgression I was quite nervous. None-too-discreetly Barrel told me that I needed to get my finger out (his words). I was wasting my time when I should be applying myself. I would regret opportunities spurned. Being told to work harder by a Michelin Man crossed with a Toby jug was salutary but, to give us both our due, his admonishment had some effect and I got my ‘A’-levels with something to spare a year later. Thus, thanks in part to Barrel, I got to university. But, like many a middle-class boy before me, I found that temptations of the flesh and the lure of the public house were impossible to resist. It was no less than I deserved that I was called-up to see the Head of Faculty. Studying Law at Aberystwyth, Professor A inquired as to why I had not seen the inside of the Land Law lecture hall all year. I told him that I had bought Land Law Tutor, Professor T‘s, treatise on the subject and discovered that his lecture notes came verbatim from his book. I suggested that it would be overkill to waste two hours a week sitting through the same material. Professor A wryly conceded I had a point about the lecture notes but gently prevailed upon me to show my face. Being ‘gently prevailed upon’ by Professor A was a serious thing so I showed my face, and the rest of me, at Land Law until the end of the year. The next time I was called in front of ‘The Beak’ was at Cambridge. At least it had nothing to do with not working hard enough or failing to attend lectures. The Head Honcho had heard that I’d been arrested at the Ash Wednesday vigil at the Ministry of Defence in London. I’d been nicked with ninety others, in my case for chalking “PEA ” on the walls of the MoD. The arresting officer couldn’t get over the fact that I’d chalked-up a vegetable, overlooking that this was a Pacifists’ Peace Rally and that he had collared me halfway through writing PEACE. (This was during my Fellowship of Reconciliation, hippyish, hug-a-tree period. These days, I’m all for nuking things.) In fairness to him, the Professor was kindly, regarding my actions as a matter of conscience. It helped my credibility that no fewer than forty-five nuns and priests had been among the ninety arrested. Once it was established both that I was OK and that my arrest would have no impact on my studies the Professor gave me his blessing. But it had been a nervous few minutes. Anyway, back in October 2009, The Boss and I turned up the next Friday to see the Head. 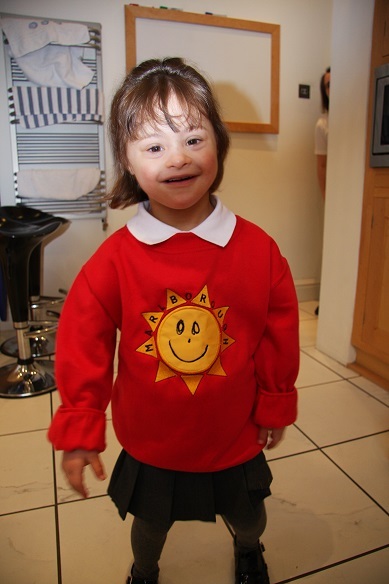 Given my own run-ins it was probably natural that I feared that our daughter, The Girl, who happens to have Down Syndrome (DS), might have broken some school rule. Natural but unnecessary. The Head just wanted to discuss The Girl’s Individualized Education Plan for the year ahead in preparation for the start of her Reception year in September 2010. For Reception, the Head teacher and SENCO (Special Needs Coordinator), the LEA and we agreed that The Girl should leave the mainstream class she was in and move to the Special Resource Base (SRB), where kids with particular needs can be given extra support. There would be a SENCO and two support assistants for about eight kids. These kids may have DS or autistic spectrum disorders or anything else. It isn’t the case that “if you have condition X you go into the SRB”. It’s more about supporting any child’s particular needs. Thus, we and the school felt that our daughter would be best placed there not because she has DS per se but because that condition had caused her some speech and language delays. This is not a distinction without a difference. Placing children into the Unit because of a condition, regardless of need, would smack of an educational ghetto. Placing them there to help with a specific need recognizes that that need might successfully be met and the child able to move fully back into the mainstream setting (with or without specific support). Indeed, this has been the case and, following her Reception year, The Girl has spent every morning in the SRB and every afternoon in with her mainstream peers. Well now here we are in Year 4 and The Boss and I are once more spending time nervously waiting in school Receptions and ante-chambers to see Head Teachers and SENCOs anew. It’s remarkable how similar the issues are for all parents in deciding upon which High School to send their kids to, whether or not those children have ‘special needs’. I guess it starts with finding an environment in which our kids will feel happy and safe, valued and supported; where they can be stretched but not broken; somewhere they can fulfil their potential. There are three ‘mainstream’ High schools that we are considering and one ‘Special High’ school. One of the mainstream Highs has an SRB-equivalent but does not offer real integration with the rest of the school. A second offers just about complete integration but no specific SRB equivalent. The third has integration and what looks very like an SRB though it is not called such. The ‘Special High’ school by contrast offers no mainstream interaction at all and is aimed at children with ‘severe’ developmental challenges; but the ‘vibe’ there is truly nurturing. The Boss and I have always taken the view that The Girl will live in an integrated world and that her education should similarly be integrated. On the one hand we need to be aware that there will be some aspects of traditional academic syllabuses that may be beyond our wee darling and that we don’t want to set her up to fail. On the other hand we can already say with some degree of assurance that opting for lowest common denominator inputs, such as a focus on equipping her with ‘life-skills’, might woefully underestimate her potential and abilities. I shall occasionally return to this issue here over the next couple of years. And if readers have any helpful experience or interesting observations to make do feel free to contact me through the Cardiff Times. In the meantime, I am getting used to feeling like a naughty teenager as I sit outside Head-Teachers’ offices. It’s a hard-wired reaction I think. Well, it is for those of us who needed an occasional kick up the backside to make the most of our school opportunities. The Girl has no such problems. She enjoys every second of every day at school and has done from the very beginning. I look forward to hearing her ‘take’ on the High School choices we need to make as a family. It promises to be an exciting couple of years!